Discussion in 'Locations & Zombies' started by ^~~^, Jul 31, 2018.
i expect a typical kefir extension of the game: much hype, great idea and useful but no chance to achieve anything noticalbe unless one invests real money or plays a few years without break. Recent examples: puppies and blueprints. So I will visit the farm once but dont get my hopes up. Dunno, if we get the kind of drops the alpha testers are getting, it wont be so bad. Guaranteed blueprint, glue, chance for some dry dog food, steel and copper dont look so bad. plus the raiders have modded melee weapons. I do agree it will require quite a few resources, especially if going melee against the bulls and giants. yea, looks like a different version of level 3 of bunker alpha. a little bit of steel/copper and some goodies but you have to invest armor, alot heal and weapons. Only good if you have too much of all that and want to see something new. Not my cup of tea. And yet another update that only increases the grind without furthering the story....following kefir's all to obvious logic, it's a fair guess that any benefits will get their first nerfing by next update. Damn -- that sounds right up my alley! 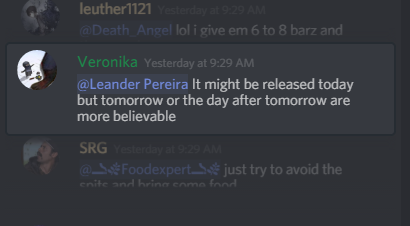 In official discord yesterday was said something like- "Farm coming in next 3 days", so today or tomorrow. I think tomorrow. I also think Farm is kinda close to worthless. Puppies were like only valuable thing. I really don't want to waste my melee, armors, food, weapons on clearing Farm, while I still need gas tank from bunker. With my game time I barely even gather enough resources to clear bunker. But as I understood, with Farm update comes also Gas Tank drop chance increase in bunker, so that is most valuable thing from this update. If yesterday......It said 3 days.....What are the odds kefir releases something today or tomorrow? This is kefir we’re talking about. I counted Tuesday also into "next 3 days"
Damn you Kefir! why do you release updates while im at work! yeah, my productivity for today just went down the drain. Ishtvaan and WAiZE! like this. Update is out. For android as usual. iOS has to wait 2/3 days again. Sigh. I was working too, need to check this farm. What is this? Did my first run, wasn't as tough as I saw in the vids. Barn didn't open for me this time. Got 1 puppy and the loot in the box is in the Pic. I'd say not bad, invested 1 shotgun, a few machetes and a saw blade mace, as well as an m16(didn't want to melee everyone). What i want to know is if it resets like the bunker. That first car u come up to...is that a one time only thing or will ot reset after a couple days. And building the bridge is easy...i had everything but enough planks. Gotta start grinding to hit 100.
on facebook they say "...it’s permanently located on the map and gets updated once in a couple of days.". So I expect that it resets every few days like bunker alpha. I doubt that the car resets - just the free energy drink that restores all your energy would be far too easy to reach every few days. Kefir would not do that - they rather sell it in an overprices package.